Since 1998 Venta del Barón, included in the PDO Priego de Córdoba, has received more than 80 awards in 8 different countries, which include "World's Best Olive Oil" by the International Olive Council as well as "Spain's Best Extra Virgin Olive Oil" from the Spanish Ministry of Agriculture. The PDO Priego de Córdoba is located in the very heart of Andalusia in the Sierras Subbéticas Natural Park. Due to its unique microclimate, the area produces internationally recognized olive oils of extraordinary quality. At the Muela olive mill in Priego de Córdoba, where the oil of Venta del Barón comes to life, the olives are cold pressed less than 15 hours after picking so that the genuine aroma of the olives is preserved, and only the best "juice" is selected according to the strict rules of the PDO Priego de Córdoba. The result is a luminous oil with intense fruity aromas of green herbs, peppermint, almond, banana and apple. Its flavor is reminiscent of vegetables such as tomatoes and artichoke, and has a slightly bitter and spicy finish. Over 70 years ago Mr. Muela Mateo Velasco, founder of Mueloliva, decided that the future of olive oil was in the perseverance of the tradition, rather than massed production. With this wise decision, he became the first to demonstrate that in the olive oil sector, attention to quality will provide the best result, a project far ahead of its time. Mueloliva, located in Priego de Cordoba, is located on a fertile plain at the foot of the Sierras Subb̩ticas where mountains and olive trees dominate the landscape. A unique microclimate, characterized by high rainfall and large temperature variations, along with a mountainous terrain, give the area specific nuances that make it different from any other. Because the Muela Oil Mill has a unique and exclusive system that allows the extraction of oil without any water or heat input during the process, all attributes of the olive oil are preserved, resulting in an extra virgin oil with a high concentration of tocoferols, phytosterols and phenols, all important nutritional components. 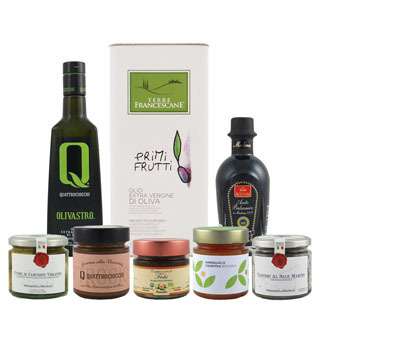 An attractive gift set with five organic olive oils. Four oils, each from a different country. Perfect gift!